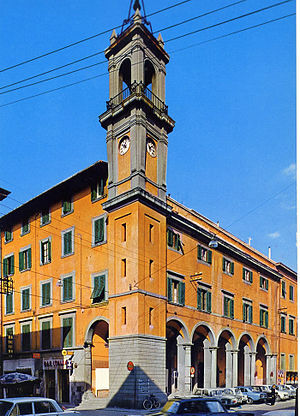 For many years, Pontedera has been a centre of agriculture, industry and commerce. The brickworks were of great importance. Expertly made by hand, the bricks used to be transported by large boats on the River Arno to the provinces of Pisa and Livorno. 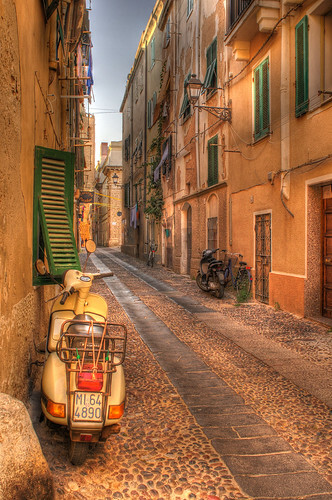 Since 1920, Pontedera has been closely linked to the Piaggio company, the largest manufacturer of two-wheeled vehicles in Europe. Pontedera takes its name from the bridge (ponte) over the River Era. Pontedera began its history as a medieval fortified town in 1200 and became very soon a Pisan frontier stronghold. Due to its central location in the Valdera the city was eagerly combated by Florence and Pisa. In 1256 the city was completely destroyed. After Florence and Lucca had reached an alliance against Pisa, Pontedera came under the dominion of Florence. In 1300, Pisa imposed again its dominion on the town, but after thirty years Pontedera fell once more into Florentine hands. The conflict between the two cities waved back and forth until 1406, when the Pisan Republic fell. After the great flood of 1333, Pontedera had been completely destroyed and was then reconstructed and surrounded by a powerful protective barrier. After the devastation caused by the Milanese in 1431 Pontedera exploded in turmoil. Pontedera was constantly under siege and was weakened by the continuing immigration from other parts of Tuscany. In 1554 there was another disaster. After the destruction of the walls and fortifications Pontedera was forced to surrender to the family Strozzi, who were bitter enemies of the Medici. During the following centuries Pontedera won increasing importance both as an agricultural and commercial center and as a river port. Under the reign of the Grand Duke Leopold the city saw its biggest splendor. The building, in neo-classical style dates back to the 19th century. The interior houses artworks by the artist Jacopo Chimenti and a “Madonna and child with five Saints” by the school of Curradi. A Romanesque church founded in 1200 and rebuilt in the Baroque period, preserves traces of the original foundations on the exterior. The “Madonna of the Rosary” by Cigoli from the late 16th century, and a wooden statue of St. Lucia by the Pisan school of 1300 are notable artworks in the interior. Built in 1928 according to the plans of Arrighi, the villa was the property of the Crastan family, and is a fascinating example of a mixture of neo-classical and Renaissance styles. After the villa passed into the possession of the Council in 1960, it became the home of the library and the setting for many cultural activities. The work of the sculptor Emilio Mancini was solemnly inaugurated in 1910. This recently restored bronze statue represents the sculptor Andrea da Pontedera (1295-1349), better knwon as Andrea Pisano. A recently-restored fountain in neo-classical style. The village is about 6 km form Pontedera away and still preserves its triple walls and the buildings, which make it one of the most beautiful villages in the Valdera. Since the 18th century it has been the fiefdom of the Torrigiani family, who still owns the Villa, which is open to the public on public holidays and for exhibitions. Holidays in the Valdera: cycling, golf, hiking, eating & drinking, hourseback riding and wellness. 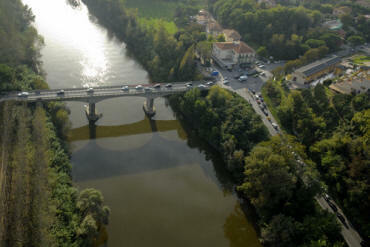 The View over bridge is not river Era but river Arno. This bridge is ‘Ponte alla Navetta’; this bridge will closed in October 2009 because new bridge will opened near.